Wesbar Vanquip specialises in comprehensive mine site compliance vehicles to optimise personnel safety, deployment and space, as well as provide ease-of-access. The company offers a customisation service to modify vehicle fleets to meet the varying demands of mining sites. We deliver consultative design solutions to mining companies and contractors, local councils, federal and state government facilities, as well as passenger, materials and food transportation sectors. Wesbar Vanquip offers practical, cost-effective vehicles to achieve optimal efficiency, sustainability and operational performance. More than 2,600 vehicles are modified annually for deployment in public services, as well as construction, mining and industrial sites. From mine site fleets to commercial vehicle dealerships and private vehicles, our consultative project management and workmanship capabilities enable us to meet specific customer challenges. Wesbar Vanquip’s products are designed to deliver a safe, compliant and clean workplace environment, giving ease-of-access, space optimisation, improved efficiency, and a reliable quality and economic product portfolio. Wesbar Vanquip focuses on user safety and facilitated access to improve efficiency and utilisation. The company addresses mandatory safety requirements before planning and identifies the optimum products, modifications and product locations. All processes are compliant with five-star Australasian New Car Assessment Program (ANCAP) ratings. Our experience in vehicle modifications aims to meet the challenges of our clients, providing expert consultancy, innovative ideas and quality solutions, delivering on time and budget. 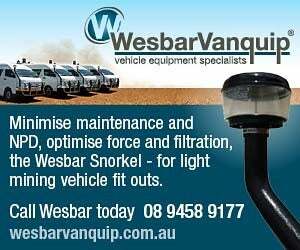 Wesbar Vanquip fits out light mining vehicles such as lunch vans or a fleet of customised 4WDs. Wesbar Vanquip offers high levels of skill, motivation and commitment to create innovative solutions through quality products and fast turnaround without comprising safety or budget. Incorporating our expertise, skills and knowledge, we take a positive approach to deliver a quick and reliable turnaround, and our ability to work around our clients’ service delivery is achieved through on-site customisations. Wesbar Vanquip’s qualified technicians check and verify each vehicle as part of our quality control procedures. Inspections are performed on all purchased products fitted with labels applied. We guarantee a full three-year warranty on all products and installations, which can be extended to five years with a number of manufacturer guarantees. Wesbar Vanquip also supplies all necessary documentation such as product information, warranty, engineer’s report and the logbook. In order to consistently offer support and service excellence, we look for new ways to create value for our customers while staying up-to-date with the latest technology, design and product quality developments. Warranty and service checks are scheduled as part of our ongoing customer service plan carried out at our Welshpool workshop, or incorporated into our mobile workshop programme. Wesbar Vanquip has a nationwide network of technical expertise, installation specialists and distribution facilities to meet local market requirements. We work with vehicle dealers, emergency services, commercial and industrial services, hospices and care homes, as well as disability services to offer cost-effective solutions. The workshop in Welshpool undertakes approximately 30 conversions and custom fit-outs a week on a wide range of work for deployment across all sections, including public service, construction, mine and industrial sites.